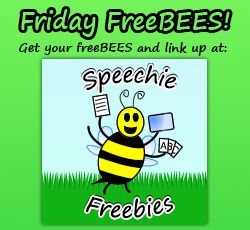 Friday FreeBEE -- linking up with Speechie Freebies! I'm pretty much obsessed with what the awesome SLPs at Speechie Freebies are doing! Not only do they have great ideas, activities, and finds - it's FREE! So when Jessica from Consonantly Speaking (who also happens to be on the awesome Speechie Freebie team!) contacted me about Friday FreeBEES, I thought it was amazing. Now, I'm dying to share my freebie with you guys (many of you probably caught it on instagram) and I'm seriously hoping that I do this linking correctly! The freebie I'm loving right now are the Speech Awards I created for the end of this year. They're a great way to sum up the awesome work your kids (and you!) did during speech. I created two on a page to save paper and ink, and they're black and white to help you jazz it up with whatever paper you choose...and to again, save ink. It's the end of the year after all!